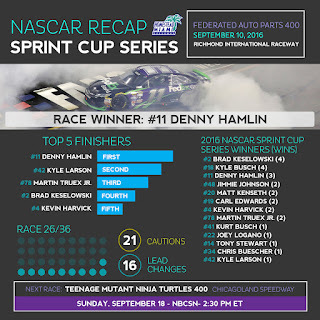 · Denny Hamlin won the 59th Annual Federated Auto Parts 400 Sprint Cup Series race Saturday night. For Hamlin, it is his 29th victory in 388 NASCAR Sprint Cup Series races. · With the victory, Hamlin now holds sole possession of 25th on the all-time Sprint Cup Series wins list, surpassing Kurt Busch (26th, 28 wins). · It is Hamlin’s third victory of the season, making it the fourth time in his career where he has posted three or more wins in a season. · For Hamlin, it is his 15th top-10 and 10th top-5 finish in 2016. · It is Hamlin’s third victory and 12th top-10 finish in 21 races at Richmond International Raceway. · Kyle Larson (second) posted his first top-10 finish in six races at Richmond International Raceway. · It is Larson’s 10th top-10 and seventh top-5 showing this season. · Martin Truex Jr. (third) posted his seventh top-10 finish in 22 races at Richmond International Raceway. · It is Truex’s 12th top-10 and fifth top-5 finish through 26 races this season. · Brad Keselowski finished fourth on Saturday, giving him his third top-10 finish in a row this season. · Kevin Harvick’s fifth place finish at Richmond International Raceway, gives him 21 top-10 and 13 top-5 showings this year. · Sunoco Rookie of the Year contenders Chris Buescher and Chase Elliott each earned a spot in the Chase for the NASCAR Sprint Cup, each becoming the first rookie to make the Chase since Denny Hamlin in 2006. · In 11 Sprint Cup Series starts at Homestead-Miami Speedway, Denny Hamlin has recorded seven top-10 finishes, four top-5s and two wins (2009, 2013). He was part of the Championship 4 who competed in the Ford EcoBoost 400 at Homestead-Miami Speedway in 2014. The 2016 NASCAR Sprint Cup Series will culminate at Homestead-Miami Speedway with the Ford EcoBoost 400 championship race on November 20. · Following the race at Richmond International Speedway on Saturday, the list of drivers who will compete in the 2016 Chase for the NASCAR Sprint Cup is set. Those drivers are Kyle Busch, Brad Keselowski, Denny Hamlin, Kevin Harvick, Carl Edwards, Martin Truex Jr., Matt Kenseth, Jimmie Johnson, Joey Logano, Kyle Larson, Tony Stewart, Kurt Busch, Chris Buescher, Chase Elliott, Austin Dillon and Jamie McMurray. · Kyle Larson, Chris Buescher, Chase Elliott and Austin Dillon are first time Chase participants. 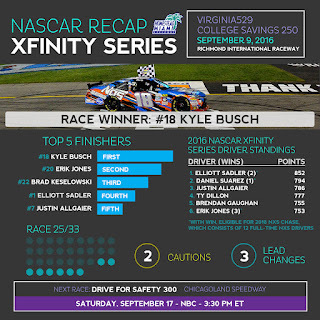 · Kyle Busch won the 36th Annual Virgina529 College Savings 250 XFINITY Series race at Richmond International Raceway Friday night. It was his 84th victory in 325 NASCAR XFINITY Series races. · It is Busch’s eighth victory and 12th top-10 finish in 2016. · It is Busch’s sixth victory and 18th top-10 finish in 21 races at Richmond International Raceway. 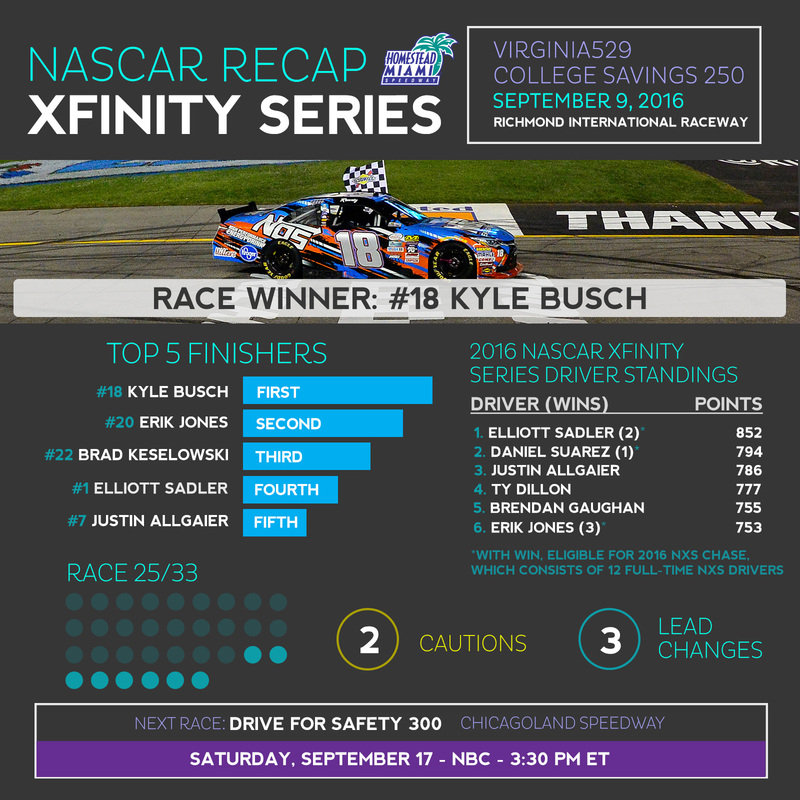 · Through 25 races this season in the XFINITY Series, Erik Jones, Daniel Suarez and Elliott Sadler have qualified for the 2016 XFINITY Series Chase following their victories. Kyle Busch, Kyle Larson, Austin Dillon, Chase Elliott, Dale Earnhardt Jr., Denny Hamlin and Joey Logano have also won an XFINITY Series race this season but are ineligible for the XFINITY Series Chase due to their full-time status in the Sprint Cup Series. Sam Hornish Jr., Michael McDowell and Justin Marks are also ineligible because they are not full-time drivers in the XFINITY Series.